Bombay Sapphire - the world's #1 premium gin. Our compelling mix of heritage, sustainably sourced botanicals and perfectly balanced flavour makes our range of premium gins the elegant choice for drinkers and mixologists alike. You will find Bombay Sapphire at the heart of the finest Gin & Tonics. Our famously balanced and versatile gin is a unique combination of 10 sustainably sourced botanicals, each personally chosen by our Master of Botanicals, Ivano Tonnuti. 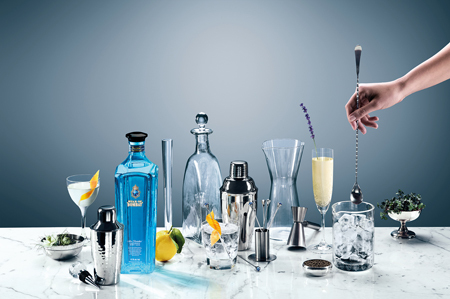 Bombay Sapphire is currently featured as the key ingredient in contemporary cocktails in over 120 countries worldwide. Since 1987, we haven’t changed how we make Bombay Sapphire. The same ten sustainably sourced botanicals chosen for their unique flavour, brought to life in our Vapour Infusion process has created the world’s number one premium gin. 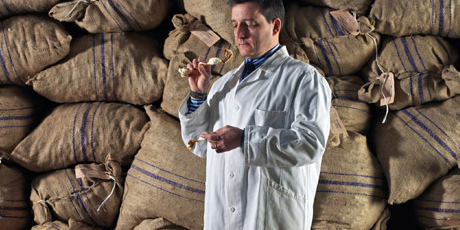 To create our distinctive balanced flavour, we use our time-honoured recipe that is based on a secret one dating back to 1761. Our gin is distilled using a vapour infusion process which was pioneered by the Dakin family in the early 1830s. 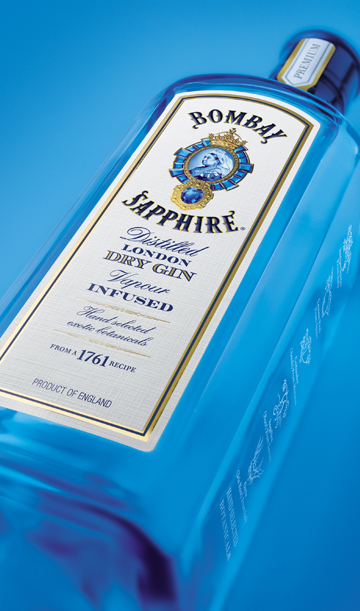 Inspired by Victorian jewels and regal crests, the famous azure blue Bombay Sapphire bottle was launched in 1987. Where other gin makers package their gins in a sea of green, our unmistakable bottle stands out in any well-stocked bar. As well as inspiring cocktail creators and gin mixologists, our creative and eclectic style also entices and intrigues new generations of designers and artists. 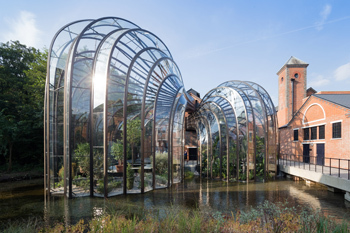 Perhaps the most famous and eye-catching example is the Laverstoke Mill glasshouses at The Bombay Sapphire Distillery, created by the internationally renowned Heatherwick Studios. Inspired by the giant sapphire of the same name, Star of Bombay is an exceptionally smooth premium gin. Star of Bombay brings together the aromas and flavours of 12 botanicals. Adding two additional botanicals to the original recipe – Ecuadorian ambrette seeds and dried Italian bergamot peel – And slowing down our signature vapour infusion process. Slowing down this unique method increases the level of extraction from the botanical oils as the vapours take longer to pass through the botanical baskets, which builds rich aromas and intense flavours. Designed to resemble precious stones and cut jewels, the Star of Bombay bottle impresses with its light refractions and deep azure colours. These hint towards the expert crafting that goes on inside the bottle. Our fine creations have been celebrated in two of the world’s most prestigious spirits competitions, San Francisco’s World Spirits Competition and the International Wine and Spirits Competition. Star of Bombay was awarded gold at the International Wine and Spirits Competition 2016 (IWSC) and Bombay Sapphire received double gold at the San Francisco World Spirits Competition 2017 (SFWSC). 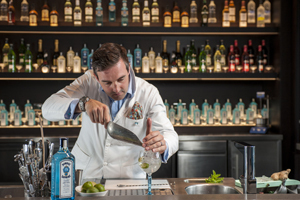 Most recently, the Bombay Sapphire distillery at Laverstoke Mill was the proud recipient of Tales of the Cocktail’s 2017 Sustainable Spirit award. The Bombay Sapphire Distillery at Laverstoke Mill. A place as extraordinary as the gin we create. Based near Whitchurch in Hampshire, The Bombay Sapphire Distillery offers visitors a unique chance to explore each stage of our creative process, and sample the final product in stunningly stylish surroundings. The distillery's centrepiece is two magnificent intertwining glasshouses, designed by Heatherwick Studios (famous for the show-stopping Olympic Cauldron and Google's Charleston East Campus). A dazzling feat of architecture, the glasshouses are constructed from over 700 individual panes of glass - no two are the same. In renovating Laverstoke Mill, we have taken the utmost care to preserve the natural ecology and heritage of the site. Once the production house for all the bank note paper for England and the British Empire, the Victorian and Georgian buildings have been lovingly restored to make a home for Bombay Sapphire gin. To build a long-term legacy at Laverstoke Mill, we've carefully designed the distillery and our processes to be as sustainable and environmentally considerate as the gin we create there. Like the hydro-electric turbine we installed in the nearby River Test, which generates electricity to help light the Visitor's Centre. And the biomass boiler provides heat and hot water using by-products from the gin distillation process as a fuel source. During the refurbishments, we diverted the River Test that flows underneath the distillery, protecting the wildlife living there. As a chalk stream, the River Test is precious resource with a rare ecosystem - we set about creating an environment where a host of different flora and fauna can thrive. We even kept key building materials from demolished buildings, including bricks and roof tiles, which have been recycled and reused in the new Distillery. Through the distillery's sprawling Victorian architecture, you can learn about the history of gin, Laverstoke Mill, and Bombay Sapphire; and also find out about the flavours of the botanicals which make Bombay Sapphire gin so unique. 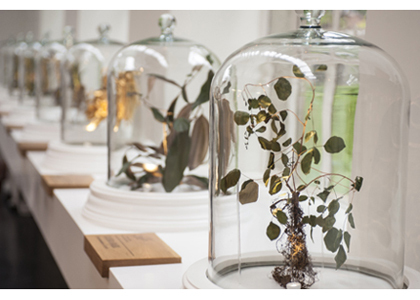 Discover the Vapour Infusion distillation process in the Dakin Still House, wander through the Botanical Dry Room, and breathe in the exotic botanicals used to make Bombay Sapphire and Star of Bombay, either independently with an interactive map on a Self-Discovery Experience, or with a knowledgeable host on a Hosted Experience. Other experiences include 'cocktail masterclasses', where you can make a range of cocktails with one of our trained gin experts, or specialist horticultural and heritage experiences with our on-site heritage expert and horticultural expert. The distillery is based in rural Hampshire, but is easily accessible from London. Take the train from London Waterloo to Overton, then hop on the carbon neutral shuttle service (timetable here) to reach the distillery in approximately an hour.